Several posts ago I opened up about my lifelong battle with anxiety and how it's affected and challenged me and throughout the years. The response to the post was overwhelming and so positive that I decided to continue the conversation. The Anxiety 101 series will talk about different topics and/or situations where anxiety has affected me, and that I feel others could benefit from discussing. Whether it's relationships, planning, travel, moving, social events, etc. If you have a specific topic surrounding anxiety you'd like me to write about please let me know. I'm totally open! A phone case for a cause. The phone case shown in this post is from a fabulous company called beCause of a Case. They sell some really pretty phone cases and have an amazing mission to give back to several important organizations. One of those is the Anxiety and Depression Association of America. 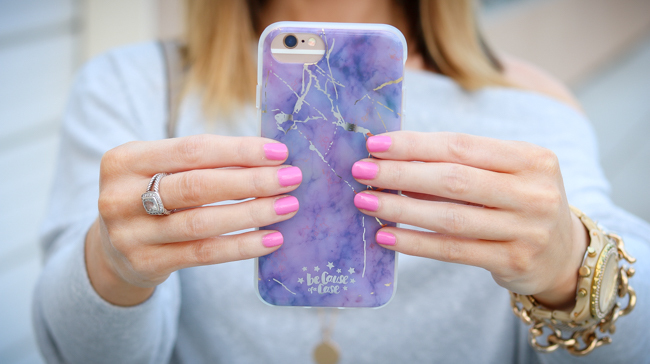 A portion of the net profits from the Cracked Amethyst case goes to this wonderful cause to help others out there suffering from anxiety and depression. I absolutely love that I can give back to a cause that I, myself, am affected by. It's a great way to support others in the community who also struggle and I'd love to see pictures of your purple cases if decide to purchase one too! When I was very young my mom would take me to daycare while she worked. Every day we would take a walk outside and then head to the play ground for a little more fun. Unfortunately, one day it rained so after our walk we were instructed to go inside. I, being a structured tiny tot, didn't know how to process this change since it wasn't part of the normal routine. So I threw myself into a puddle and proceeded to throw a tantrum instead. That was the day my daycare teacher told my mom I struggle with transition. She informed my mother that in order for me to smoothly transition when a change arises, I need as much notice as possible. For example, if we were going to stay home on Sunday but then my parents decided we would go to church, my mom would have to tell me the afternoon before, "Hey, Amanda, we are going to go to church tomorrow morning." It may sound silly if you've never had issues with transition, but for me, advance notice really helps. If my mom were to spring the change on me first thing in the morning my mind would panic and feel very chaotic. To this day, even as a twenty-eight year old, I struggle. I do, however, understand myself much better so I try to take a deep breath and relax when changes arise. And I tell those close to me about my mental structure so they can help me when plans take unexpected turns. Justin knows I don't do well with spontaneous adventures so we usually try to plan things in advance. And, luckily, he's not Mr. Impromtu, so we do really well together! What's interesting is that ever since I started working I've thrived in overly chaotic, "trial by fire" environments. Where change happens frequently and you just have to deal. And surprisingly, I've been able to succeed without anyone ever knowing my mind feels flustered. In many ways, I think being immersed in a chaotic, fast-paced environment has helped me to get over many of my transitional "freak outs." I'm more motivated by success than I'm debilitated by change. So maybe it takes finding experiences that challenge your anxiety to help you to move past it, or at least to cope. And in those experiences finding something that means more to you than letting anxiety take hold... money, promotion, reward, fulfillment, helping others, etc. If you've been following my recent blog posts, and my posts on Instagram, you know that Justin and I are moving back to Virginia very soon. And after our recent house hunting trip, found out we are moving even sooner than originally planned... which means everything needs to start happening quickly. Our to-do list is quite lengthy and I lay in bed at night thinking about all the addresses I have to change, the items I need to ship ahead of time, and any appointments I need to make in California before we switch states. Fortunately, since I moved cross country less than two years ago, I'm prepared for what's ahead which helps curb the fear of the unknown. Btw I wrote a post all about moving cross country and things to do and know that you can find HERE. Something that really helps me when transition involves schedule changes and/or lots of tasks, is making a to-do list. Right now I have several running written (I'm a paper person) lists that are helping me to keep my mind at ease. Places to change my address, things to-do before leaving, blog posts to write, pictures to take... you get the idea. Pulling these jumbled swirling thoughts out of my mind helps me to clear my head and relieves my feelings of angst. I encourage you to try it if you haven't before! If you struggle with transition as well I'd love to know what you do that helps and I'll be sure to share it with everyone else too. Anxiety presents itself in many different ways for different people and can be triggered by many different things. So dealing with triggers will be different for everyone. But keep in mind, in all cases, that before all else, stop... take a deep breath... and remind yourself that everything will be okay. I've learned that anxiety doesn't define me. It's a part of me that makes me unique and even though it may challenge me, I won't let it control me. Quick Disclosure: I'm not a counselor or professional in the areas of anxiety or depression. This post contains my personal experience and things that have helped me along the way. I am more than happy to share and start a discussion but if anyone feels they need professional help, please reach out to your physician for assistance. Quick life update! JUSTIN AND I GOT A HOUSE! Wooohooo! We are both literally over the moon that we found our perfect home while house hunting in Virginia last week. We only had two days to see all there was to be seen so it's amazing we found "the one." We ended up seeing over 25 houses and properties with our realtors (they were so patient and helpful) and just signed the official paperwork yesterday morning! It was pretty serendipitous actually. The house we ended up buying wasn't even on our list. We were driving down a street where we were seeing another home for sale when I spotted a fabulous property that was also on the market. Luckily, we were able to go right in and as soon as we opened the door the angels sang. It was like saying yes to the dress haha. We both walked in, looked at each other, and knew. It was the only home we could see ourselves living in and the only house we loved. It was definitely "meant to be." For those who don't know, we've been renting for the past two years... in a good neighborhood... but in a house that is very, very old. There are several things we haven't had like central heating/air, an ice maker, a dish washer, and we even have multiple doors falling off lol. Everyone has told us we aren't going to know what to do with ourselves in a new home, and they are probably right! I can't wait to show you guys around once we are there. For some reason I get really anxious when I go and eat at a restaurant. I think it has to do with the fact that there's so much waiting and I never know what the environment is going to be. I hate it because all I want to do is have a romantic meal with my boyfriend instead of having to worry.